👋 Hi! I'm Michael, dad to 👦 Noah, 👧 Emma and 👶 Mona and this is our project called Sticker Dad Up. I first started Sticker Dad Up as a project to do with my kids (then only two 👦👧) back in 2017. 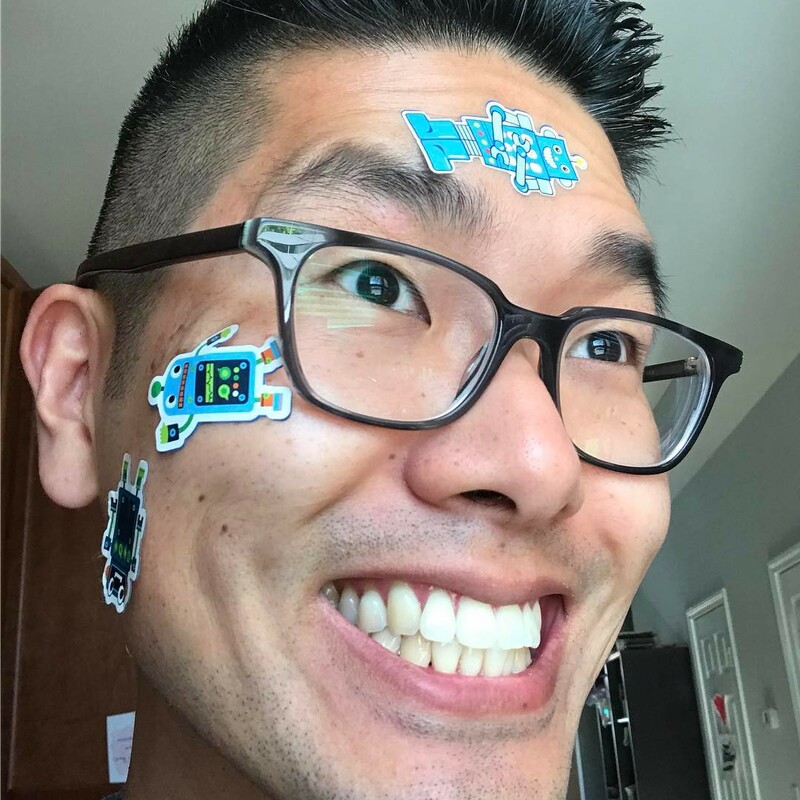 A project where each day I would let my kids put stickers on me and we'd share it with the world on Instagram. I started Sticker Dad Up to be a fun project that my kids and I could use to create memories and hopefully put a smile on others. But a few months into the project, I was transitioning into a new job, we were traveling for family weddings, we kept using the same old stickers and so the project went stale. But whenever my kids got a new sticker, whether it was from the grocery store or school, they would stick it on me. I think it was their way of saying they really enjoy Sticker Dad Up. Fast forward to the present day and now there's three kids (👦👧👶) and the idea of Sticker Dad Up just wouldn't go away. So this is why I decided to pick it up again in 2019. To solve the problem of running out of interesting stickers, I took inspiration from an Internet legend of a project called I Wear Your Shirt. In the project, Jason Zook, the creator wore 365 different shirts from companies that sponsored each day of the year. I created this website so that individuals and businesses can sponsor a day of our Sticker Dad Up project and send us their stickers. During the month of April 2019, I'll be taking 366 sponsorships (2020 is a leap year 😜). Then starting from May 1, 2019 until April 30, 2020 my kids will put a sticker on me and we'll share it on this site and Instagram everyday. You might be asking, "Why take sponsorships?". Well, if I'm being completely honest, motivation; with your generous contribution, I'd love to pay off some of our family's debt and put away savings for our kids' future. Thanks so much for checking out the project, I hope you'll join us in our year long project and brings a smile on your face 😊.